We have a lovely day planned the weekend after Mothers Day which will make any mum very happy to receive. The day will involve a beautiful High Tea from Mad Tatters Tea Party at Canecutters Cottage, a glass of champagne on arrival, prizes, market stalls, a gift bag to take home and lots more. There is also an added option to buy the deluxe ticket which will include a half hour treatment. 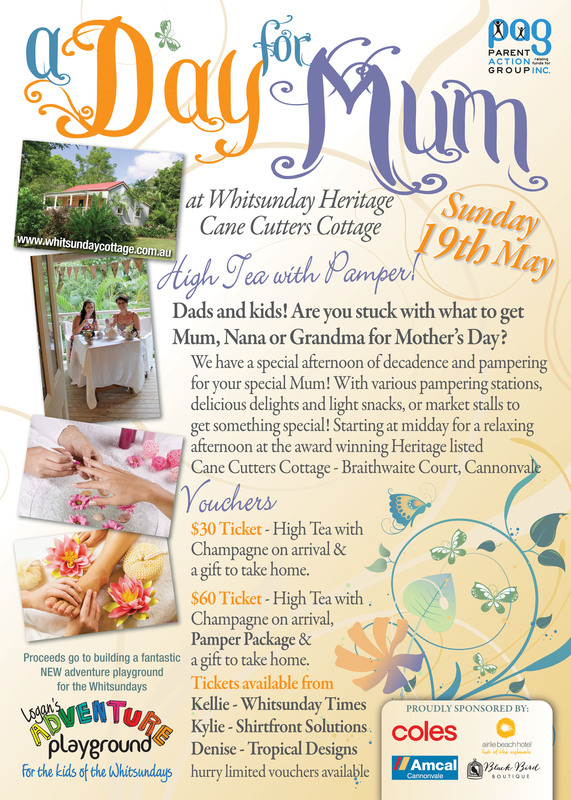 Tickets are available from Whitsunday Times and numbers are limited so Mums make sure to drop a few hints…. leave the flyer open or on the kitchen bend to ensure that we get to really spoil you and your friends at our ‘Day for Mum’. Posted on May 7, 2013, in Events. Bookmark the permalink. Comments Off on Day for Mum – 19 May 2013.